Something tells me you'll want to be bookmarking this one folks. 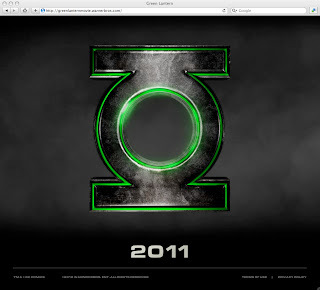 Geoff Johns tweeted to the tweetable crowd earlier today that greenlantern.com was finally up and running. Right now it's just a teaser site, with a big shiny logo and a smog machine that's been left running, but don't be surprised if that changes soon. Make with the jump already! i really like Ryan Reynolds. one of the funniest movies i've ever seen is this "Clerks like" film called Waiting starred Reynolds. he's got such a knack for sarcastic dead-pan humor. i'm not sure what to think of him as the Green Lantern though but i'm keeping an open mind. there is a fan made youtube video Green Lantern trailer that is featuring the guy from the short lived sci-fi series "Firefly" which was also made into a movie that wasn't too bad called "Serenity". that actor seemed a bit more ideal to me for the role. I agree. Reynolds as Deadpool I totally get. Reynolds as GL? Not so much. Then again I was one of the nay-sayers when Nolan announced that he'd cast Heath Ledger as the Joker. Maybe Ryan will surprise us. Hey guys, thanks for all the comments! Personally David I was adamant that Bradley Cooper was going to be Hal Jordan, especially after The Hangover. He screams 'Hal Jordan' to me. And like you Craig, I was one of those guys who balked at Heath been the Joker, yet now I can't watch that film without saying 'wow' over the job he did. Will Ryan be the same? Here's hoping. oh i know Ryan can play non-comedic roles well too. but i have to say Smokin Aces is one of those rare occasions where we have a difference of opinion. it had it's moments but certainly a film i'm glad i didn't spend money to see. We certainly disagree their David but that's sweet as. I wouldn't say Smokin Aces is a favourite of mine by any means but I don't regret forkin' over the money for it by any means.